For some of the most adorable cupcakes Melbourne has to offer, look no further than The Cupcake Bakery. The standard cupcakes, at $3.80 each or $3.50 online, are an affordable afternoon sweet treat available in a range of flavours including vanilla strawberry, choc peppermint, chilli choc and many more. 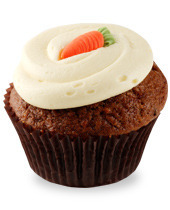 The standard carrot cupcake from The Cupcake Factory. For the ultimate taste of sugary indulgence, try one of their deluxe cupcakes. At $4.50 instore and $4.25 online, they come in flavours such as molten choc, custard tumble and rocky road. 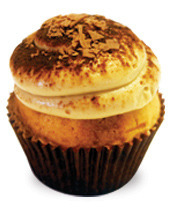 The tiramasu flavoured deluxe cupcake. Most flavours of standard and deluxe cupcakes are available in miniature versions as $2 'cupcakies'- just in case they weren't already cute enough. Whilst you're visiting their store, you can wash down your desserts with a milkshake, coffee or iced tea. Flavour shots such as 'chocolicious' and 'strawberry kiss' able to be added to any drink. The Cupcake Bakery has a smattering of stores in the city, with Melbourne Central, Collins Street and Flinders Lane locations. In September, they will expand their reign of cupcake cuteness to the South-Eastern suburbs, with a store opening in Chadstone Shopping Centre. A web savvy bunch, The Cupcake Bakery offer an online ordering service, with your order being able to be picked up or delivered straight to your door if you're located in Melbourne or Sydney. If you're feeling indecisive, they offer packages of assorted cupcakes, with a minumum order of twelve for delivery. Mmmm. I'm afraid you've made me rather hungry with this article. I might just have to give them a try.